Nothing’s more fun than sharing and swapping a good recipe. Here are a few of our favorites for making everything from skin nurturing soaps and scrubs, to solid perfume and more. Share your recipes by using the “comment box” at the bottom of this page. Melt base and scent. 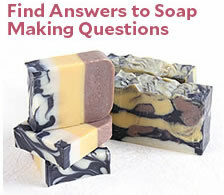 Stir in cornmeal, pumice and clay continually until it gets to a point where it will stay suspended in the soap. By this time, the soap will be quite thick and cool. Pour into molds. 5% Superfatted Lye Amount 9.477 oz. Ounces of water recommended 23.760 oz. At trace, add fragrance and 1 Tablespoon of honey. 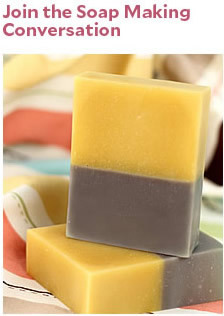 Do not insulate your soap as the honey may cause your soap to superheat. 5% Superfatted Lye Amount 9.815 oz. Ounces of water recommended 23.100 oz. Flavor Oil and Stevia for taste. Melt beeswax gently over a double boiler (or in the microwave if no double boiler is available). In a separate container, heat the lanolin oil and shea nutter up until it is fully liquid. Add the olive oil to the melted lanolin oil and shea butter. Combine the beeswax and all the oil, stir well. Add flavoring (if desired) and pour into containers. This makes (4) four ounce containers of gel-crème. Germaben II orPhenonip .16 oz. Heat the water and Glycerin to 170 degrees and set aside. Heat the Emulsifying Wax until melted and add to the CroThix and Jojoba. Stir. Add the water and glycerin to the Emulsifying Wax, CroThix and Jojoba. Mix until the creme is 105 degrees (or less). Add your fragrance and preservative and package in jars or an easily squeezable package. Apply under make up for a more smooth application or as a night creme. This lotion bar does not use cocoa butter so you can use any fragrance or essential oil that your heart desires and not have a chocolate over-smell. Melt the beeswax in a separate container and the butter/oil in another container. Add together, mix well, stir in FO/EO and pour into containers. Mixture will harden in approximately 1-2 hours. The cooler the mixture is upon pouring it, the less ‘divets’ you’ll get in the bar (that sunken spot at the top of the bar). Mix with water until the mask has a consistency that you like. Apply to body or face and wait for clay to dry fully. Take off with a warm water washcloth. If all over body, jump in the shower to get off more quickly than a washcloth. 1. Slice a bar of soap into thin (1/8 to 1/4 inch) layers. 2. Position small metal cookie cutters and punch out designs. 3. Carefully push soap out and arrange on a pretty dish in the bathroom. You can take different colored soaps and make a pretty bag of them tied with a ribbon on top. Note: May want to wear kitchen gloves while punching out soaps – the metal cookie cutters are sharp. Carefully mix all ingredients into a microwave safe container. Make sure they are all clumped together. (Do not put lid on) Heat at high power for 20 seconds, stir, then repeat until fully melted. Then pour into a small bottle, and freeze for 15 min, or until solid. Then you can apply it on your lips! The zinc oxide will provide a opaque, matte effect to your lipstick. If you use just mica, you will have a more sheer lip balm. This lipstick is a more waxy lipstick than the Sheer lipstick. Melt the waxes in a double boiler. Once they are fully melted, add the Castor Oil and Jojoba Oil. In a separate bowl, add your mica to the liquid oil of your choice. Mix in well and make sure there are no clumps. Add the colorant mixture into your double boiler and mix well. Remove this mixture from the double boiler and let sit until mixture begins to cool and thicken (thus suspending the colorant through out the lipstick). Once cooled to an appropriate thickness, pour into jars or tubes. Melt beeswax gently over a double boiler (or in the microwave if no double boiler is available). In a separate container, heat the emu oil up until it is fully liquid. Combine the wax and all the oil, stir well. Add flavoring (if desired) and pour into containers. Melt cocoa butter in double boiler, remove from heat. Mix creamed coconut, almond oil, honey and oatmeal, blend well. Add mixture to melted cocoa butter, blend well. Add Tangerine Essential Oil (or your favorite EO! ), blend in. Pour mixture into ice cube trays, chill until firm. Toss one into tub of running water and enjoy! Note: Use caution upon exiting tub, it may be a bit slippery. But, oh, what a soak! Package this in a wide mouth jar and sell with a shaving brush! Add melted melt and pour to the goatsmilk base; stir in fragrance oil and ground calendula. Pour into wide mouth jars; wait 24 hours to harden. Soap will get slightly hard but not hard enough to pour into individual molds. In ceramic or glass bowl, thoroughly mix dry ingredients. Add essential oil and boiling water. NOTE: scent will be strong, but will fade slightly when pastilles dry. For colored dough, blend in food coloring one drop at a time until desired shade is achieved. Blend ingredients to form a ball. Working with a small amount at a time, roll dough between palms of hands to form small balls. Note: cover unused dough to keep it from drying out. Melt all fixed oils together, and add fragrance oil to melted oils. 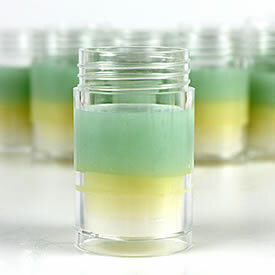 Pour mixture into small jars or twist-up tubes and sell as a solid perfume!